Dr. Neubauer COMBINATION EFFECT offers playing characteristics for which combination bat players have been waiting a long time. 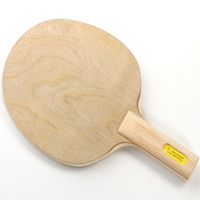 This exclusive special development from the renowned blade expert Achim Rendler has been created to offer different speed values on the two sides of the blade by the use of a unique plywood composition. One side has a low rebound coefficient, so that the ball is slowed down. This allows returning short over the net, with a maximum spin reversal when blocking with frictionless long pimples. The trajectory is very low in order to prevent the opponent from immediately attacking it. At the same time even float balls can be attacked with frictionless long pimples through aggressive pushing and counter-attacking. The other side is faster so that the ball can be attacked forcefully by the use of offensive rubbers. COMBINATION EFFECT also offers the same outstanding control as our renowned Dr. Neubauer SPECIAL blade. Dr. Neubauer COMBINATION EFFECT: The new weapon for combination bat players. Like all other blades in our product range COMBINATION EFFECT is available with all three handle types (straight, flared and anatomic). A special version (with different handle, blade size etc..) can be provided for a surcharge. The faster side is the one with the yellow "Dr.Neubauer Combination Effect" label in the handle. The slower side is the one without the yellow label in the handle.